This cottage has been newly refurbished to a high standard in March 2018, so new layout and details can be found on our website. Everything we needed for our stay, the cottage is in a perfect location with great views and a river setting. The house is very comfortable. There are little things, which doesnt work. Please look for the toaster and the showers. Perfect for a group holiday in a great location. I booked this on a recommendation from a family member, and it did not disappoint. The cottage was warm and well equipped, and there was plenty of space for my party of 6 adults to eat and relax.Also good spaces to store our walking gear. The only downside is the need for a warning about the decking outside which can become very slippery when wet (one of our party sustained knee damage in a fall). Otherwise, a fantastic holiday in a beautiful setting. 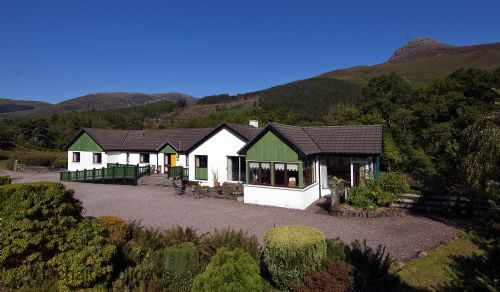 Well equipped and comfortable cottage within walking distance to Glencoe village and mountain walks. Spacious accommodation with excellent views of the surrounding landscape. Other amenities within easy reach by car. Perfect house in a perfect location, what's more to say, except the staff are attentive, polite and everything is hassle free. I would highly recommend the property. This is a lovely, spacious cottage, however ,there are snags. There are no instructions for operating the tv or dishwasher .There are excellent instructions for the cooker. We were disappointed as to the number of chipped or broken items found in the kitchen and polo mints and other items found in the main bedroom. The promotion photo shows a ramp to the cottage, however ,firstly this had not been opened before our arrival despite our prior notification it was needed. The thick gravel in the car park makes access to the ramp well nigh impossible for anyone who is mobility impaired. Despite the spaciousness of the cottage, none of the bathrooms could accommodate a wheelchair or rolater, so overall, the cottage is not as access friendly as initial appearances suggest. Enquiries were dealt with very promptly indeed. Glad you like the cottage. A huge amount of effort went into refurbishing it this spring. Housekeeping oversight noted and will also be looking carefully at the crockery etc as happy to replace anything which has been damaged. As regards the access, Hawthorn does not offer any increased mobility access and for that reason we don't promote it. Yes, there is an access ramp and the barrier at the top simply lifts out should it be needed. However, there is no increased mobility access inside due to the older nature of the building. Sorry. this is our third visit to this cottage. Look forward to welcoming you back for another visit. Hawthorn Cottage will be getting a full makeover as of next week, so you'll find a few changes next time you come.